What is line busting? In retail store jargon, it means ringing up customers anywhere within the store wireless network. The idea is that customers do less waiting and more buying during peak season. New tablets for mPOS in retail stores top managers’ wish lists every year. Now that nearly all credit and debit cards are EMV chip-enabled, it’s an opportune time to utilize NFC technology aboard tablets to conduct touchless transactions. A word to the wise: save on costs by shopping around and making smarter tablet purchases. Only buy devices that work with what you have in place. Make sure to compare tablet pricing against what your POS solutions provider is charging. They already take enough with subscription and transaction fees. Here’s what you can do when shopping for mPOS tablets. To state the obvious, you want mobile systems fully integrated will your overall bookkeeping and personnel management toolset. We’ll assume you already use your POS setup to that end. If your house, er, store, is in order with managing the main store POS hardware, the primary considerations to add mPOS becomes compatibility and cost. Protective covering and a sturdy build. Display that’s large enough to negotiate while staying portable—tablets with 10-inch displays seem to hit the sweet spot by many vendor recommendations. Vendor recommendations: ShopKeep works best on an iPad (5th gen), iPad Pro, or iPad Mini 4 running iOS 10. Check pricing for the Apple iPads for Shopkeep. Square POS supports iOS and Android devices. Toast recommended mobile device of choice? Look for an unlocked 7-inch Samsung Galaxy smartphone. The accounting and inventory software works optimally with Microsoft Office programs, and Access databases. There are other Windows 10 tablet options worthy of a look. HP Retail Case on a HP Pro Tablet, Lenovo ThinkPad X1, ASUS Transformer Pad will also work. Customers will need gift return receipts, so you will need to add receipt printers around the store to accommodate mPOS transactions. Bluetooth or Wi-Fi options are both available. When comparing receipt printers in the online store, look for Star Micronics receipt printers: SM-220 and SM-230 for mPOS; and the SM-TSP600 for iOS ecosystems. Also Epson TM-Series are mPOS favorites and offer both Wi-Fi and Bluetooth connectivity. Can you use a legacy tablet for mPOS? In many cases you can. Apple Tablets should be 4th generation or newer, running iOS 10 or later— recommendations by Vend and ShopKeep. Apple Tablet deals page has iOS filters to help select the right hardware. Be more wary of Android devices. Wipe the device before relegating it to mPOS use. Android OS is the leading operating system worldwide but its popularity has a negative side effect—a rash of Android cyberattacks launched from shady applications. 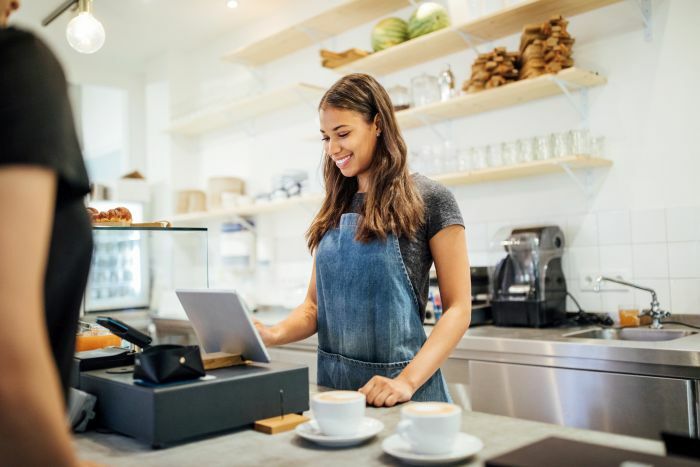 Securing a Wi-Fi Network for retail If you’re managing your own Wi-Fi setup at your retail location, make sure you’re keeping your transactions secure and compliant with a four way segmentation network setup. Change default service set identifier (SSID) passwords or passphrases for Access Points in the store. Separate guest access, employee access, and access for software and hardware for processing payments. Place hardware or server-based firewalls between wireless networks and payment systems. Configure the firewall to restrict most traffic from Wi-Fi to terminal where cardholder storage is located. Authenticate at device- and user- levels for access to terminals for cardholder storage and transactional data. Veteran line busters: What are your go-to devices for mPOS operations? New tablets for mPOS in retail stores top managers’ wish lists every year. Now that nearly all credit and debit cards are EMV chip-enabled, it’s an opportune time to utilize NFC technology aboard tablets to conduct touchless transactions. A word to the wise: save on costs by shopping around and making smarter tablet purchases.